Unjust: LGBTQ Youth Incarcerated in the Juvenile Justice System examines how LGBTQ youth who are incarcerated in juvenile detention and correctional facilities face bias in adjudication, and mistreatment and abuse in confinement facilities. LGBTQ youth also lack supportive services when leaving the criminal and juvenile justice systems, often forcing them back into negative interactions with law enforcement. Given that nearly 40% of incarcerated girls in identify as LGB and 85-90% of incarcerated LGBTQ youth are youth of color, it is crucial that any effort to change the way youth in the United States engage with the juvenile justice system must consider the unique experiences of LGBTQ youth. 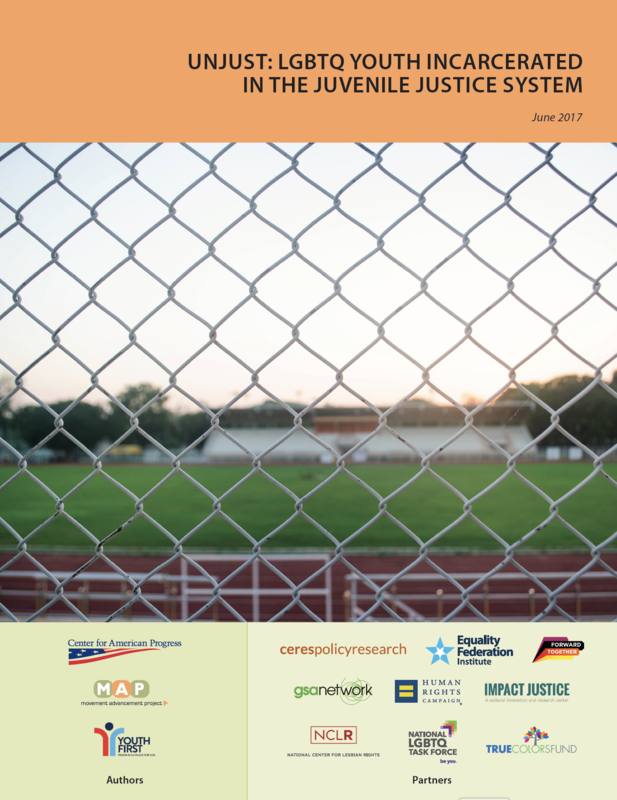 This spotlight report highlights the experiences of LGBTQ youth incarcerated in the juvenile justice system. This report builds off of the Unjust series released in 2016. Click here to see the other reports in the series. Movement Advancement Project, Center for American Progress, and Youth First. June 2017. Unjust: LGBTQ Youth Incarcerated in the Juvenile Justice System. http://www.lgbtmap.org/criminal-justice-youth-detention (date of access).